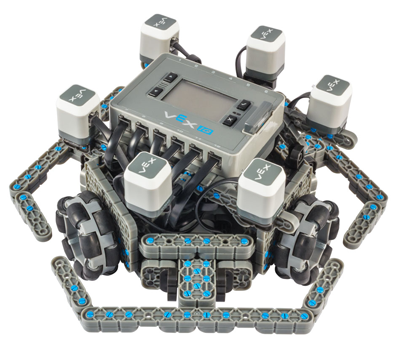 The Kiwibot is a recently released robot design for VEX IQ. It comes with an autonomous program, but it's written in RobotC. So let's port it to Robot Mesh Python for VEX, and see if we learn anything interesting. The Kiwibot has six TouchLEDs, 3 bumper switches, and 3 motors, which fills I/O port on a VEX IQ Robot Brain. In autonomous mode, it drives around mostly-randomly, switching drive modes every time it bumps into something. The six TouchLEDs indicate which drivemode the Kiwibot is currently in, and when touched will throttle the motors or shut them off. So, first things first, let's write the TouchLED code. If the end of a line hangs off the edge of the screen, then bugs can hide where you won't see them at a casual glance. If we had forgotten the () on the very last is_touch then the if expression would always evaluate as True, and we would be very confused when the robot acted like the TouchLEDs were constantly being pressed. It's ugly and I hate it. So let's write something a little nicer. print x # This prints "Global" to console. The interpreter will not produce any warnings or errors when it does this. Next, let's check to see if any of the bumper switches are pressed, written in a straightforward imperative style. There, 7 fewer lines, 19% less code. The total savings is better than that, since we work with the TouchLEDs a lot in this program, so we'll be using NamedColorLEDs() frequently. There's still improvements to make, though. We could make a helper function for the motors too, but the savings wouldn't be nearly as great, and I don't feel like it would be worth having the remember the order of arguments. Really, what we want is an abstraction that hides the stuff we don't care about (motor power, order of arguments) and provides an interface to what we do care about, telling the robot in which direction to drive. Basically what we're doing here is adding a bunch of force vectors. I don't have room here to go into a full explanation, so I'll just give you an idea of why it works. For any given motor, if it wants to go forward, it wants 100 power, backwards, -100 power, and for the two angles parallel to its axle, 0 power. The sine functions have the handy property of taking angles and outputting a smoothly varying curve between -1 and 1, crossing 0 twice for every 360 degrees. So, we just poke the output of sine right into run. Motor FR and FL are 120 and -120 degrees away from motor B, respectively, so we just adjust the angle we're giving them. We also flip the input angle 180 degrees so that angle 0 is at the front of the robot. While we're at it, the bumper switch if statements are all pretty repetitive, differing only in the parameters passed to them. Why not simplify things there too? This block of mostly-functional code is only a single line shorter than the imperative code it replaced, but almost all of the core logic is broken out into reusable functions. There's only six lines of imperative-style code left. The last thing Bump() calls before exiting is SpinRandom(). It (approximately) spins the robot between 100 and 260 degrees, to avoid running into the thing it just ran into again, and chooses a new drivemode randomly, avoiding the drivemode it just used, to somewhat mitigate its tendency to get stuck in corners. If the time is 7:00 now, then 8 hours later it will be 3:00. Usual addition would suggest that the later time should be 7 + 8 = 15, but this is not the answer because clock time "wraps around" every 12 hours; in 12-hour time, there is no "15 o'clock". Likewise, if the clock starts at 12:00 (noon) and 21 hours elapse, then the time will be 9:00 the next day, rather than 33:00. Because the hour number starts over after it reaches 12, this is arithmetic modulo 12. In DriveForward we have to put the % 120 if-case before % 80, because for the number 240, both % 80 and % 120 would equal 0. (240 / 80 = 4, with no remainder) This is a classic pitfall of modulo math, as exploited in the fizz buzz test. And that's it! To check out the rest of the drivemodes, or to play with the code yourself, take a look at the project page.